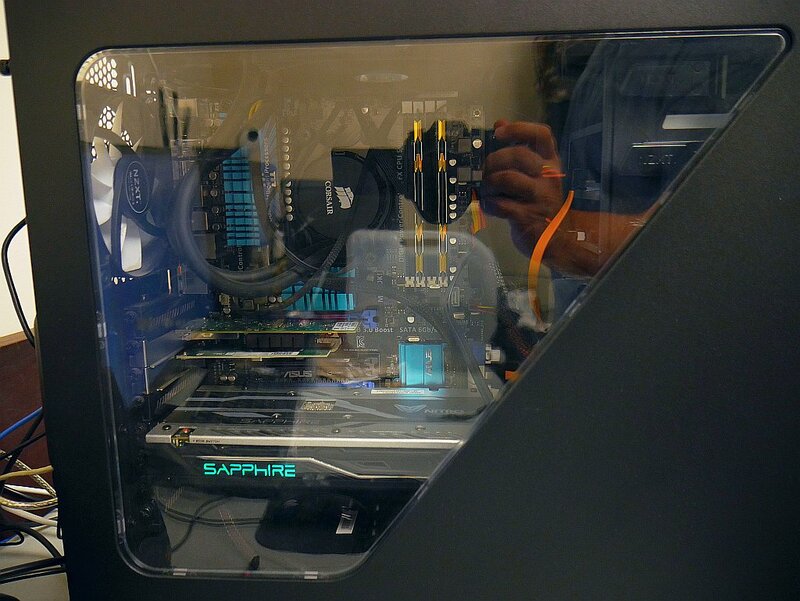 Back in 2014 when Jesus rode dinosaurs and Nazca aviators ruled the skies, I wrote an article about the AMD FX-9590 and how it beat all of the modern Intel chips of the day in a price-to-performance comparison I performed. 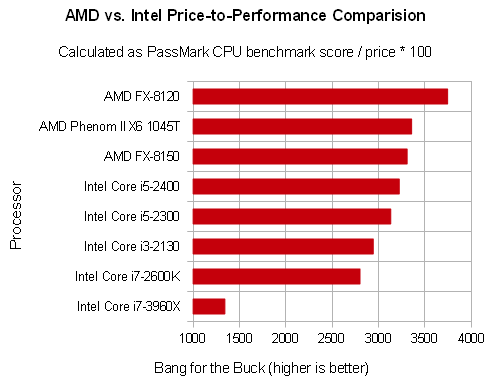 It was a better value than every Intel Haswell and Broadwell chip available in 2014. 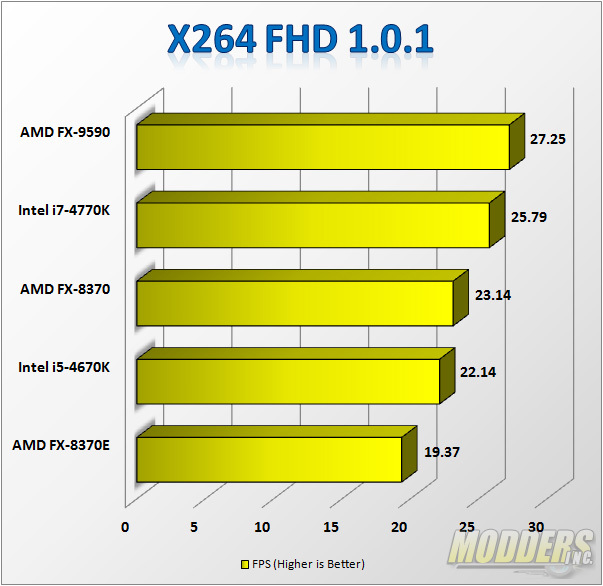 Of course, benchmarks of newer systems against the aging FX-9590 show that gaming performance is clearly way better on newer platforms, largely due to PCI Express 3.0 support (FX-9590 boards max out at PCI Express 2.0 x16) and, more recently, the rise of consumer DDR4 memory and NVMe solid-state drives. As I was poking around various system benchmarks for newer platforms, I got curious about the FX-9590’s price-to-performance ratio today, four years and several processor generations later. 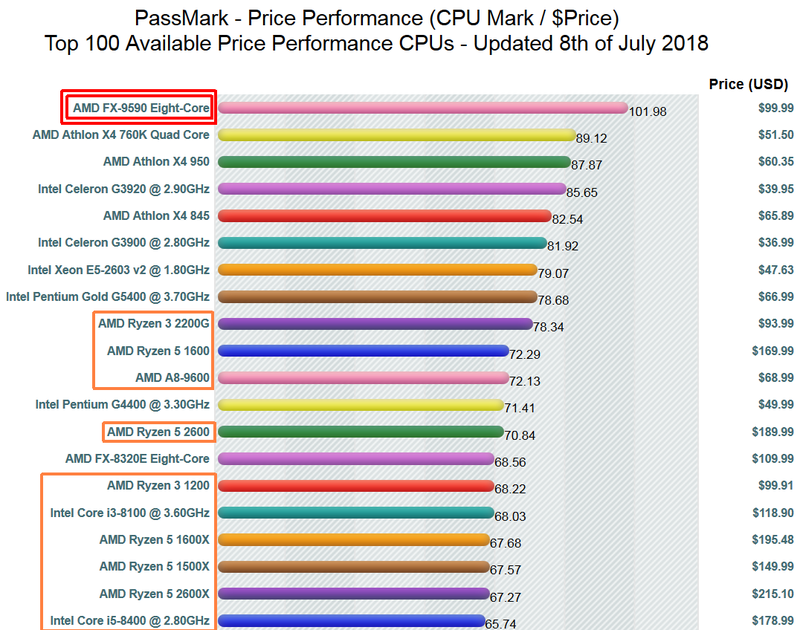 You’d expect a chip that’s several generations long in the tooth to fall behind in value due to improvements in newer platforms, especially with AMD’s new Ryzen architecture fighting Intel’s 8th-generation i7 offerings. Modern CPUs in the picture are boxed in orange. Notably, the price of an FX-9590 is way down from the $250-$300 range where it hovered for a long time. Amazon prices really are close to the stated $99.99 price tag. 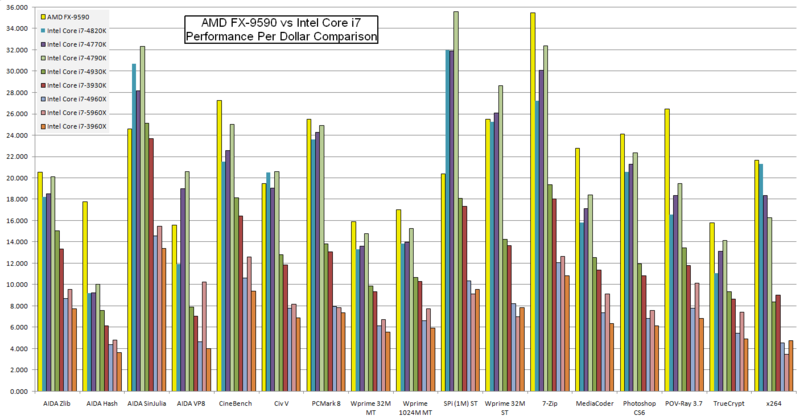 Four years after the power-sucking 220W 8-core beast was released, it continues to dominate in provided performance per dollar. I’m still using the FX-9590 system I built four years ago for heavy-duty computing work and video editing. I have other computers that are actually from the current year, but none of them is as fast as the FX-9590 box. Long live the AMD FX-9590. You’re my favorite space heater and I hope you keep humming under my desk and making me uncomfortably hot for a long time to come.